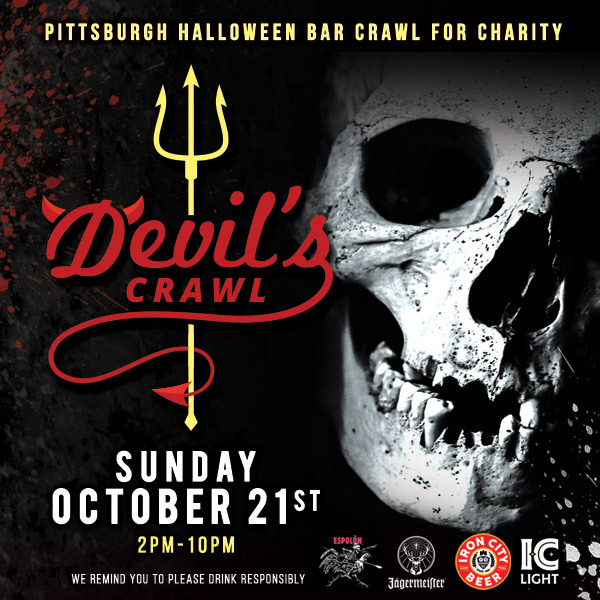 This Halloween, join us Sunday, October 21st (Steelers Bye Week) from 2:00PM-10:00PM as we creep through the streets of Pittsburgh and TREAT our way into some of the top bars in the historic South Side for The Devil's Crawl - Pittsburgh! Devil’s Crawl is a Halloween themed event benefiting various local charities that gives you access into multiple locations, no cover charge all night at all locations, plus great drink specials from: IC Light & Iron City, Espolòn Tequila, and Jägermeister (until 10pm). Participants are encouraged to dress up in their most creative attire in affiliation with the Halloween holiday for the chance to win the Grand Prize Costume Contest (best costume and best group costume). We have something for everyone. Just look at all the participating bars and restaurants! So, gather your friends and get your costume now. This event is strictly 21+ with proper ID required. Devil's Crawl tickets prices WILL increase. Entrance to each venue is subject to capacity - if one venue is at capacity, admission will be on a "1 in 1 out basis" or you can try another as some venues will be more popular than others. BUY YOUR TICKETS NOW!